These drop outlets were made with speed in mind! Made to fit your 2 3/4" and 2 3/8" whole saw. Just drill the hole, place the outlet tube in, and crimp into place. 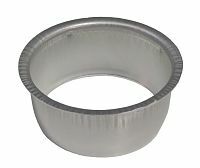 Designed to fit 2" x 3" rectangular and 3" round downspout.